I'll preface this post by saying that while I am aware this is supposed to be a blog discussing software and the intertubes, I have long since given up attempting to stay on topic here the whole time because it's just not in my nature. It's not that I'm scatterbrained or anything, more that I just have far too many unrelated interests for my own good. One of these disparate interests is commercial aviation, you can check out my Transport category to read more if that's your cup of tea. I narrowly missed post 1011 by one entry; 1011 isn't only an important number because it could be interpreted as binary (it's 11 in decimal by the way), but also because it was the service number of the commercially unsuccessful Lockheed L-1011 TriStar developed in the 1970s. For those not versed in the history of the jetliner, the L-1011 TriStar was a widebody commercial airliner developed shortly after the Boeing 747 for customers who wanted the 747's range but didn't need as much passenger capacity. While the temptation was there to place deck chairs on the nose to resemble a 747, the high cruising speeds of the jetliner would have made safety hard to guarantee, ant it would have been horribly noisy for the passengers sitting in such chairs. And a bit chilly. I'm such a dolt. As with the McDonnell Douglas DC-10 with which it competed in the same market segment, the L-1011 TriStar was a trijet with the second engine mounted in and under the vertical stabiliser. Unlike the DC-10 which placed the second engine above the fuselage, the L-1011 used an S duct similar to the Boeing 727 which was far more complicated to design and maintain, but was much quieter and more stable. Indeed the L-1011 was one of the quietest commercial jetliners of the period which I'm sure people who had houses in the flight paths of jetliners would have appreciated. One of the interesting aspect of the Lockheed L-1011 TriStar's development was it's turbofans. Unlike McDonnell Douglas, Lockheed opted to partner with Rolls Royce exclusively for the engines for the new jetliner. In a cruel twist, given the complexity and size of the project Rolls Royce went bankrupt and had to be purchased by the British government, an eerie thing to read about given all the bailouts governments around the world now are undertaking. 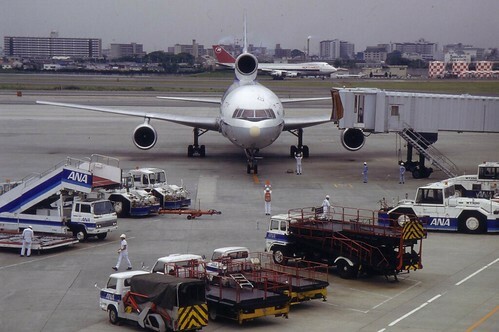 Ultimately because of Rolls Royce's financial difficulties Lockheed were unable to complete any of their airframes until over a year after Douglas had entered the market with the DC-10. Despite the bad initial reputation the DC-10 had with reliability and noise, the quieter L-1011 was never able to recover from this year long lag in development time, and Lockheed abandoned all commercial airline manufacturing after delivering 250 aircraft, only half of what they would have needed to break even. Another interesting aspect of the development of the L-1011 which I didn't even know about until reading it's article on Wikipedia (and if it's on Wikipedia it has to be true!) was that Lockheed officials and senior members of the Japanese Diet were even involved in a bribery scandal! 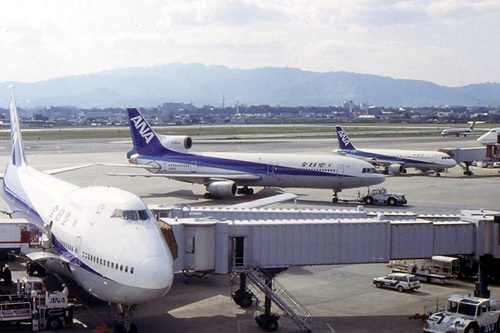 Lockheed bribed the members of the Japanese government to subsidize ANA’s purchase of L-1011s. The resulting political scandal led to the arrest of Prime Minister Kakuei Tanaka. Within Lockheed, board chairman Daniel Haughton and vice chairman and president Carl Kotchian resigned from their posts on 13 February 1976. Tanaka was eventually tried and found guilty of violating foreign exchange control laws, but was not charged with bribery, a more serious criminal offense. Definitely a very troubled airliner, but the L-1011 still to this day is one of my favourite designs just because it was so unconventional, and because of Lockheed's decision to proactively tackle the problem of sound pollution. Now if only the eejit who has the cheap 4 cylinder 1990s Honda Accord across the street from us removed the silly, 1 metre wide muffler so we wouldn't have to put up with his noise pollution every evening and early morning we'd be home free. "Muffler" in this case is really stretching the term. Then again, who am I to judge, perhaps he's desperately attempting to compensate for something he lacks, or can't do very well. I take public transport and ride motor scooters for this reason.